At the beginning of his action phase, Ji Ling can choose compete with any character. If he wins, he can select any character. This character is then under attack from Ji Ling. If he loses, his action phase ends. "Double Edged" is an option. Ji Ling does not need to activate this power at the beginning of his action phase if he does not want to. If Ji Ling is the victim of Capture, he cannot use "Double Edged" since he lost his action phase. If Ji Ling wins the competition in "Double Edged," the Attack produced has no color and has no elemental property. Weapon abilities can be used with this attack. It is also not considered to be his one attack for his action phase, so he may use an actual Attack during his turn. If Ji Ling wins the competition in "Double Edged," he does not need to attack the same person with whom he competed. He can attack anyone. "Double Edged" is very nice for Ji Ling when he wins the competition. This ability allows him to waste a hand card of an enemy and it gives him a free Attack of infinite range. It is particularly brutal against a character with one unit of health and one hand card, as Ji Ling can waste this last card and attack them to bring them to the brink of death. Ji Ling can compete with an ally in order to ensure that "Double Edged" works and gives him a free Attack. The loss of Ji Ling's action phase when he loses the competition in "Double Edged" is a greater disadvantage than the advantage that he gains from the extra Attack that results when he wins the competition. This loss is particularly bad when he is used in a game with many players (as it takes longer for Ji Ling to get another turn in games with many players than it does in a game with few players). While Ji Ling can compete with an ally to ensure that "Double Edged" works, this maneuver is expensive, as it costs his team two cards in order to get one free Attack. 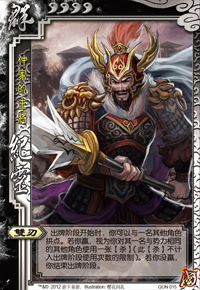 Liu Bei/Guo Jia - These characters can give Ji Ling cards with high numbers for "Double Edged." Liu Shan - Liu Shan's "Pleasure" makes it more difficult to attack him. This makes it more difficult to target him with "Double Edged." King Ji Ling is a poor king choice. He has no defensive options and the effect of losing his turn as king is damning if he loses the competition in "Double Edged." Loyalist Ji Ling is a poor loyalist choice. The king's team is usually smaller than that of the rebels, so losing a turn with "Double Edged" is very detrimental. Rebel Ji Ling is a good rebel choice. Because the king will be frequently targeted by the other rebels, it will be difficult for him/her to keep high-numbered cards to fend off "Double Edged." Also, the occasional loss of a turn is not as bad for the rebel team because it is usually bigger than the king's team. Spy Ji Ling is a serviceable spy. If he makes it known that he is the spy, he may not be targeted as often by other characters, making it easier to store high-numbered cards for "Double Edged." Also, it is easy to 'strike a deal' with a member of one team by having them use a low-numbered card in the competition for "Double Edged" in order for you to attack one of their enemies. They may not even realize that they are being negatively impacted as well since they have to waste a card for your ability. This is a nice way of keeping the teams balanced. While the makers of QSanGuoSha did not change Ji Ling from his original Kingdom Wars incarnation, he does not seem to translate well into the original version of this game. As mentioned previously, losing the action phase is damning for Ji Ling so only use "Double Edged" when you are confident that you will win the competition. When using Ji Ling use a similar mindset to what you would use if you were using Xiahou Yuan - target the weak. Enemies with few hand cards and few units of health will have the most trouble avoiding "Double Edged."